In this video, Demetra presents an astrological lecture about the significance of asteroids in pointing to one's fate or destiny. 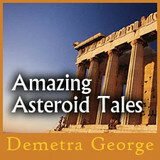 To learn more about asteroids and astrology, visit Asteroid Lectures in our audio download store. Get Demetra's latest book: the first of two volumes offering a practical and extensive teaching on using Hellenistic techniques in modern astrological practice.